I've updated and expanded upon the fondue recipe that was originally on this page - see A Proper Swiss Cheese Fondue. It's not surprising though. The Swiss Cow gives so much goodness, in the form of dairy products, to the people. Cheese, of course is well known, and I hope to describe some of the best Swiss cheeses I've encountered while living here in the future. But it's not just about cheese. Butter. When you live in the States, butter is just..butter. You barely think about it. If anything, you try to avoid it, since it is saturated fat, and if you can substitute something healthier that is tasty, like a good olive oil, why not? Swiss butter is something else though. The first time I melted some butter in a pan in a Swiss kitchen, I couldn't believe it. It smelled so good, unlike any butter I'd ever encountered before. Perhaps it's the quality of the food the cows eat (most cows are still allowed to graze freely outside in small family farms). Perhaps it's the freshness of the butter - since most butter sold here is unsalted, it is very perishable and has to be sold quite quickly compared to the salted butter that's common in the U.S. There are fancy butters here, which come with promises of the essence of the Alpine herbs and flowers on which the cows fed. These are expensive though, so we stick to the plain old Die Butter. Die Butter is still a wonderful thing. It contains more water than U.S. butter, so it spits and sputters in the pan, giving off those marvelous smells. In the spring, it has a very faint taste of the wild garlic that the cows eat. Milk also is somehow different. Although we no longer go to the local dairy farm with a pail to buy milk, the milk here is somehow much richer tasting. It's so rich in fact that when my sister Mayumi visited here she couldn't drink it straight up - to her, it tasted too creamy. We usually have Milchdrink (low-fat milk, about 2%) rather than Vollmilch (whole fat milk) around, but it still tastes much more like Milk than what I was used to drinking in New York. And then there's cheese. There are many varieties of Swiss cheese, which is sort of amazing considering how tiny this country is. Cheese is an integral part of life. It's both an everyday food item, and something for a feast. Some time ago, we invited some friends who were visiting from the States, and we served them a cheese fest - 6-7 different kinds of cheese, a plentiful amount of good bread, a bit of dried meat, lots of fruits, and of course some good red wine. They were rather surprised - they'd never even thought of just serving cheese for a meal, and afterwards they were very, very happy. Finally, there are the two great warm-cheese dishes, usually served right about now during the cold winter months. Fondue is cheese melted in a wine-kirsch mixture, into which you dip chunks of bread. (I've never encountered other dipping stuff here like apples and so on.) And there is raclette, a big chunk of cheese held close to the fire until it starts to melt, and then the melting cheese is scooped off with a knife onto a plate, and eaten with bread, boiled potatoes, cornichon pickles, and sometimes some dried beef. I've updated and expanded upon the fondue recipe below. See A Proper Swiss Cheese Fondue. A healthy amount of kirschwasser (kirsch). About 1/4 cup will do, or more. In an earthenware fondue pan, or regular saucepan, heat up the wine. Put in the cheese and mix mix mix until it's all melted and bubbly. Add the kirsch and cook some more. Put the pan on a burner or tabletop cooking range thing, to keep warm while eating. Skewer the bread on long fondue forks and dip. Optionally, dip the bread in kirsch before dipping into the fondue. For dessert, serve grapefruit and blood orange wedges. Submitted by maki on 2003-12-02 02:16. My family uses Emmenthal instead of the Vacherin-Fribourgeois in your recipe. We also add garlic, black pepper, milk, and just a bit of cornstarch. My folks and their friends say that it's traditional for a man who loses the piece of bread off his fork into the fondue to buy the next bottle of wine, and for a woman who loses her piece of bread to kiss the man she came to the party with. We also serve baby corn, grilled chipolatas (tiny bratwurst), prosciutto, and green olives with our raclette. I've been to a dinner party where they also had pearl onions, but my dad hates onions, so maybe that's why we've never served them at our house. I really like to sneak in some steamed cauliflower and broccoli, but that's not traditional as far as I know. I love it that they still garland the cows' horns with flowers when they come down from the mountain pastures in the fall! One of my former teachers from Austria likes to tell her American students that the cows in Switzerland have legs that are shorter on one side than the other from generations of grazing in the alps. They don't completely fall for it, but the "She's gotta be pulling my leg" expressions just crack me up. I've been randomly surfing into your website. 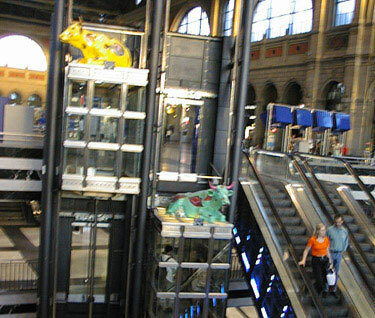 What i found here is that picture with cows on the lifts in the railway station in Zurich. Firstly Thank you & God Bless for taking the time to share such treasures! Sorry but I desperately need some advice. Where can I buy swiss butter? I intend making Michele Roux's Briouch recipe. He highly endorses Swiss butter. I must try it even if I must visit Sweden [which I intend doing sometime]. I really have no idea (I'm guessing you're in the UK)...and I suppose 'go to Switzerland' doesn't help much ^_^; FWIW, Michel Roux Jr.'s uncle lives in Crans-Montana, a ski resort in Switzerland, and Michel Roux Jr may have had Swiss butter there.